A Dahlia bus crashed into the tail of an MTA bus and then a Flushing storefront, killing three people including its own driver, officials said. FLUSHING — Three people died and more than a dozen others were injured when a charter bus from a company with a bad history blew through a red light and smashed into the tail of an MTA bus in a Queens intersection Monday morning, according to officials and video. A recording of the accident shows the driver of the Q20, which had 15 passenger, make a right turn from Main Street onto Northern Boulevard when the eastbound Dahlia bus, driven by Raymond Mong, 49, hurdles through the intersection, slamming into the rear of the city bus about 6:16 a.m, according to the NYPD. 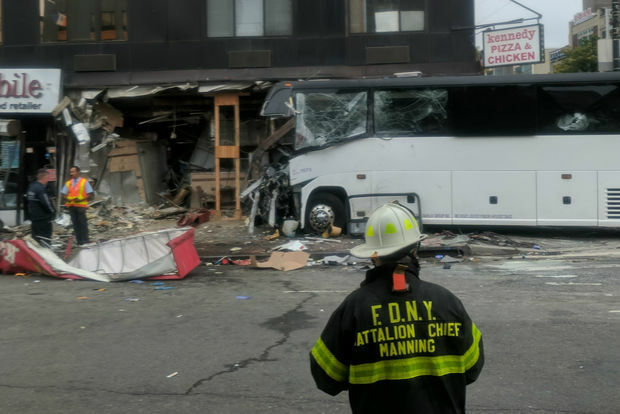 The charter bus was moving so quickly that both buses spun around and hopped the curb, killing pedestiran Henry Wdowkiak, 68, and slamming into a Kennedy Fried Chicken along with other stores at 134-04 Northern Boulevard, according to MTA Chairman Joseph Lhota. "These buses spun around. That requires a tremendous amount of speed," Lhota said at the scene. Mong, the driver, and Gregory Liljefors, 55, an MTA bus passenger, were also killed in the crash, officials said. Mong was an MTA bus driver until he was fired in 2015, according to the transit agency. It was unclear when he started driving for Dahlia. Witnesses said the scene was pandemonium. "In seconds, it was chaos," said Mike Ramos, 48, who was sitting in his car nearby at the time. "The car vibrated from it." "A lady was pinned under the debris there in the back of the bus. She was screaming, 'Help me! Help me!' One leg was twisted up. [...] A guy was bleeding all over the place. The city bus driver was sitting on [the ground] with his head back in pain," Ramos added. Video shows emergency personnel tending to wounded people as they sat on the curb while others were wheeled on stretchers into waiting ambulances. Dahlia has a history of unsafe driving and was even involved in a fatal crash in February 2016, according to federal records. The full circumstances of Monday's crash weren't immediately clear and NYPD officials said they were still investigating. "The first thing we need to understand is what happened here," Mayor Bill de Blasio said at the scene. "It's a tragic morning here in Flushing, Queens. It's hard to compare to anything I've ever seen—the sheer destruction from the impact of this collision," the mayor added. 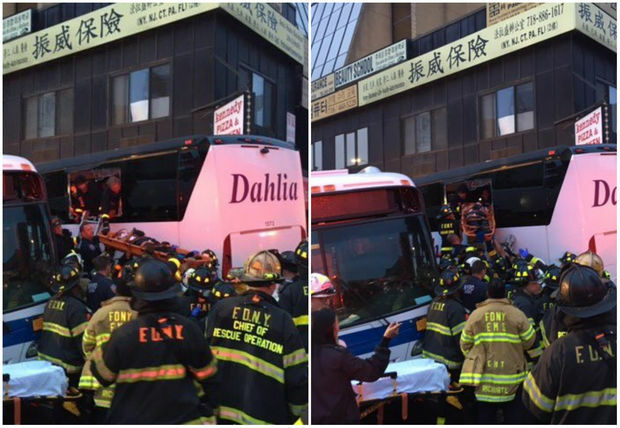 The fire department rescued passengers from the chartered bus through its back window, photos show. Sixteen others were injured, six of the critically, police said. They were treated at area hospitals including Flushing Hospital, New York Hospital Queens and Elmhurst Hospital, officials said. The MTA driver suffered injuries that weren't considered life-threatening, Lhota said. "He's being spoken to right now by investigators," Lhota said. Photos tweeted by the Fire Department show passengers being rescued from a window near the back of the private bus. A man who picked up the phone at the Dahlia bus company said he was still trying to get information about what happened and declined to comment. In February 2016, a 65-year-old Dahlia driver rolled a bus over on a snowy Connecticut highway, killing one person and injuring 36 others, while en route to a casino, according to reports and records. The bus company has been sued three times by multiple passengers injured in the crash, records show. Federal regulators have cited Dahlia repeatedly for unsafe driving after a long history of traffic violations. One of its buses sped more than 15 mph over the speed limit in September 2015, according to the Federal Motor Carrier Safety Administration. The next year, the company was again cited for one of its buses speeding and passing over vehicles improperly, records show. It also illegally parked one of its buses in the road in 2016, records show. This year, the company has been cited on three different occasions for speeding and failing to obey a traffic device, federal records show. Though Monday's crash was the first fatal one at that intersection, many people have been injured in crashes there since 2009, city data shows. Five motorists have been hurt in crashes there this year, according to the city's Vizion Zero map. Thirty-three motorists have also been injured in crashes there since 2009, the map shows. De Blasio will determine if traffic safety improvements need to be made at the intersection under his Vision Zero initiative, he said. "We're certainly going to look at this intersection, but first we need to know what happened here," the mayor said. Traffic around the two major intersections is expected to be heavy throughout the day, officials said. Commuters should expect delays on buses running through the area of the crash including the Q13, Q16, Q19, Q25, Q28, Q34, Q65, Q66 and QM3, MTA officials said. Emma Whitford and Jen Chung contributed reporting.